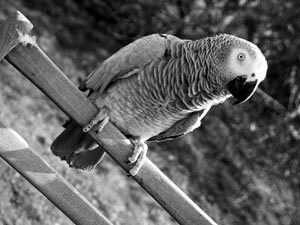 You will already find all sorts of useful African grey parrot related information on this site from keeping parrots, how to look after them to the do's and don't on what to feed them, we have also incorporated an african grey forum for you to talk to the rest of the community of like minded individuals and experts. We have developed a classified ad section of the site where you can look for or breeders may post up their parrots for sale and parrot related peripherals such as cages, so feel please do browse or register to post ads for FREE! We also have our own section of the site to show you the progress of some of the baby parrots we have bred and also there are testimonials from people that these hand reared babies now reside with. Latest Member: Please welcome zoso101, our newest member. We're on YouTube, Check us out!! African grey parrots are often hand reared by professional breeders and handlers for the pet trade as they make affectionate and rewarding pets. They are usually long lived with an age span ranging from 25 to 50 years, this can vary dependant on diet, disease and stress. They are very intelligent birds, some have exhibited the ability to process words and information and respond with an appropriate response (ie a conversation rather than repetition). The birds are excellent mimics with a capability of over 2000 words as well as imitating household sounds such as phones ringing. A pet Congo African Grey ParrotThe history of African Grey parrots kept as pets dates back over 4,000 years. Some Egyptian hieroglyphics clearly depict pet parrots[verification needed]. The ancient Greeks also valued parrots as pets. This custom was later adopted by wealthy Roman families who often kept parrots in ornate cages. King Henry VIII of England also had an African Grey parrot. Portuguese sailors kept them as companions on their long sea voyages. While comparative judgements of animal intelligence are always very difficult to make objectively, Psittaciformes are generally regarded as being the most intelligent of birds. The African Grey Parrots are all in the genius Psittacus. Only a single species makes up this genus, Psittacus erithacus. This species is further divided into three subspecies or races. The African Grey Parrot is the perfect mix of brains and is we believe one of the most beautiful parrots of them all. This species of parrot has become quickly recognised as the best speaking parrot of the lot, I write this while listening to Reggie our family Grey chatters in the background, god knows where he picks up half the things he says, he seems to pick up words and string them together, now that's intelligence to the higher degree!! !